Six of the men, all German citizens ranging in age from 20 to 30, were arrested Monday by tactical police units in Saxony, the state in which Chemnitz is located, and Bavaria, federal prosecutors said in a statement. 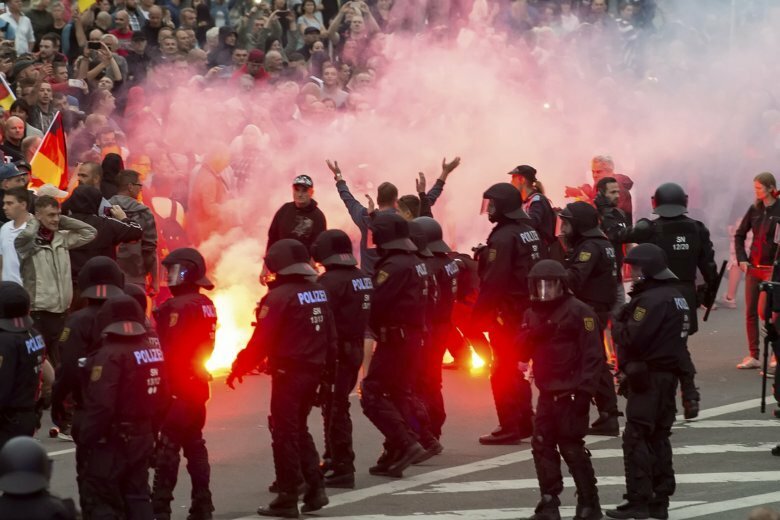 The men are alleged to have formed a group calling itself “Revolution Chemnitz,” together with a seventh suspect who was arrested in a separate case last month. The seventh man, identified only as 31-year-old German citizen Christian K. for privacy reasons, is alleged to have been the group’s leader. Five of the men — Christian K. and four others identified only as Sten E., Martin H., Marcel W. and Sven W. — allegedly attacked several foreigners in the center of Chemnitz on Sept. 14, armed with bottles, weighted “sap” gloves and an electric stun device. Prosecutors said the attack was a “test run” for another attack the men planned for Oct. 3, Germany’s national unity day. A spokeswoman for federal prosecutors, Frauke Koehler, said authorities were investigating whether the men were involved in anti-foreigner violence that erupted in Chemnitz after the killing of a German man in August. A 23-year-old Syrian is being held on suspicion of manslaughter and an Iraqi man is still being sought by police in that case. Investigators secretly intercepted the men’s communications and found that they “had already made intensive efforts to obtain firearms,” Koehler said. “If the allegations are further substantiated, then investigators will have succeeded in conducting an important blow against far-right terrorism,” she told the Funke newspaper group.